Summary: The "Ding" Darling Wildlife Society, Inc. will expand the J. N. ?Ding? Darling National Wildlife Refuge?s education program regarding the various species of sea turtles, especially as it pertains to the unique environment of the subtropical barrier islands of Sanibel and Captiva in the Gulf of Mexico. The islands of Sanibel and Captiva are two of the top tourist destinations in the state of Florida and world famous for their shelling beaches. This poses a great threat to the sea turtle population on the islands. The Society and the staff at the J. N. ?Ding? 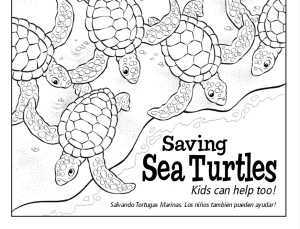 Darling National Wildlife Refuge will develop and distribute a brochure and a children?s activity book to educate the public on the significance of various sea turtle species to the ecosystem and the importance of avoiding sea turtle nests. In addition, the Society will purchase real life replicas of several species of sea turtles as well as a cross section of a Loggerhead Sea Turtle?s Nest that will be used in educational presentations and programs. Results: Since the delivery of the sea turtle and nest replicas in January, they have been used in presentations on a weekly basis, with attendance between 20 to 50 at each presentation. In addition, the Refuge staff regularly visits elementary schools and the Sea Turtle Replicas are now an integral part of the educational presentations. Since delivery, the staff has visited seven elementary schools and taught over 3,500 students in Kindergarten through third grade. The children's activity book was published and is now available for the public. The activity book is currently being distributed at the Education Center and at all classroom presentations. In addition, staff has distributed this brochure to other non-profits. The activity book has also been placed on the Society website in the kids section so that children and families can print from home. Download Coloring Book. The Sea Turtle brochure is currently available for the free at the Refuge Education Center, are being handed out by volunteers, and were used for educational purposes at one of our information tables during our annual Family Fun Day, which more than 4,000 people attend. With Sea turtle season upon us, various hotels and resorts, especially those on the gulf front properties, are receiving copies of this brochure. We have spoken with management at various hotels to ensure that the placement of the brochure on the room table is a part of their daily routine. We will also ask the hotels to have the brochures placed in their brochure racks and, during nesting and hatching season, will ask that they have the brochures directly on the registration desks. We have also delivered the brochures to the Sanibel Captiva Chamber of Commerce Visitors Center, which has an annual visitation of more than 200,000 people. The volunteers at the Visitors Center were also briefed on the brochure and importance of sharing it with visitors during the high sea turtle nesting/hatching season. Finally, the brochure is also available on the Society's website so that the public can view from home or on their mobile device. Download Brochure.